Galaxy Macau has launched its new premium direct VIP Club, JinMen8. Located on the 50th floor of the Ritz-Carlton hotel tower, JinMen8 VIP Club took three years to complete and comes at a cost of MOP$300 million. 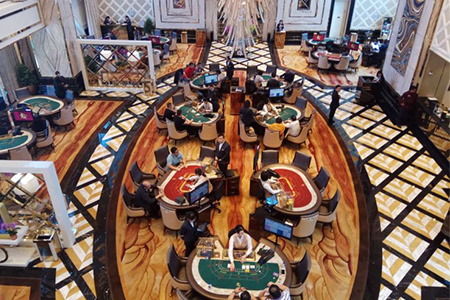 It boasts 18 tables split between five private rooms and an open floor area, with betting limits ranging from HK$1.5 million to HK$3 million. According to Galaxy, JinMen8 is built around three main pillars – architecture, food and service – including a sky-high ceiling equivalent to the height of five floors and 200 service and dining staff representing a staff-to-customer ratio of 5 to 1.